As mentioned in previous blog posts, we have spent the past two years helping out small business owners in developing countries by participating in microloans to those business owners through Kiva. It’s a way for us — just regular, ordinary people who have a bed & breakfast in North Carolina — to help in the fight against global poverty. One cool thing about Kiva is that they allow third world entrepreneurs to apply for loans in groups, allowing the funds to be distributed toward improving more than one business. Our current loan is being utilized by four ladies from Pakistan: Kosar Parveen, Rasheeda, Sugran and Ailas. 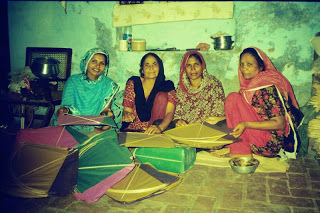 The group sells kites, which are very popular with children, and the income they receive helps pay for their household utilities. Three of the ladies also want to start selling leather, while the fourth will use her part of the loan to help grow her husband’s existing leather business (Kiva does allow a woman to take a loan on her husband’s behalf, a common cultural practice in some countries). Best wishes to these ladies with their ventures, and congratulations to Mavjuda, another female entrepreneur whose business we funded — Mavjuda received a microloan earlier this year to expand her clothing store in Tajikistan and she has paid back her loan in full, and we got to use that money to help the four ladies above. Being able to re-use our funds to help others is another great thing about Kiva. Stay tuned to see where our next microloan will go!